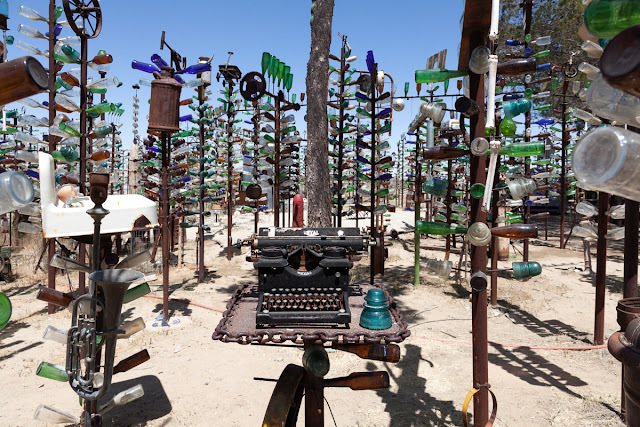 One of the most well known spots on Route 66, and a place I've wanted to visit for a long time, is Elmer Long's Bottle Tree Ranch. 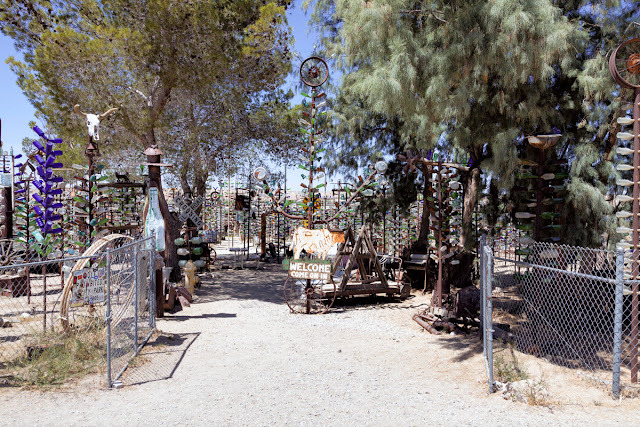 Located in Oro Grande on National Trails Hwy, aka old Route 66, the Bottle Tree Ranch is Elmer's front yard and free to visit. Donations are accepted and the nice thing to do if you enjoyed your visit. Parking is just on the side of the road. 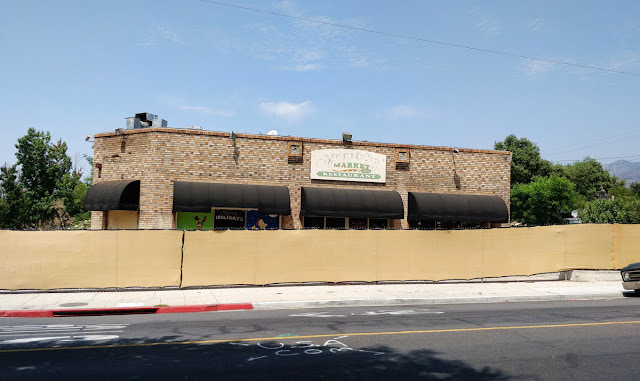 The photo above is looking along the front of the property. 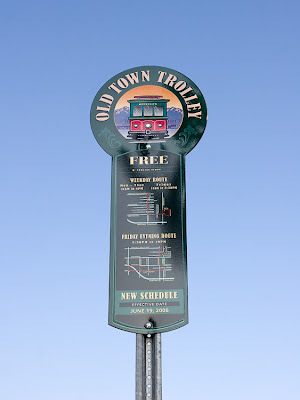 The front gates are open with a sign welcoming you inside. 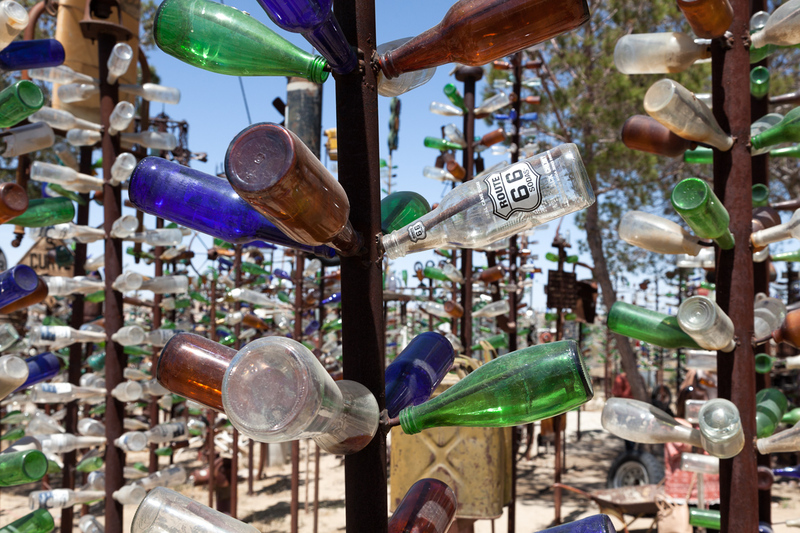 There are over 200 bottle trees here along with countless other items collected over many years. 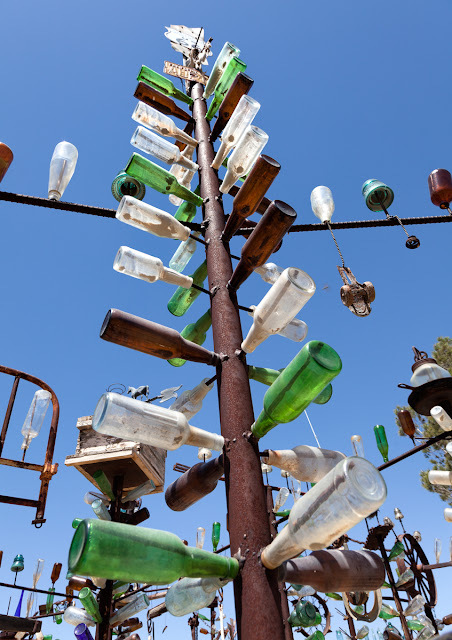 A look at one of the bottle trees. 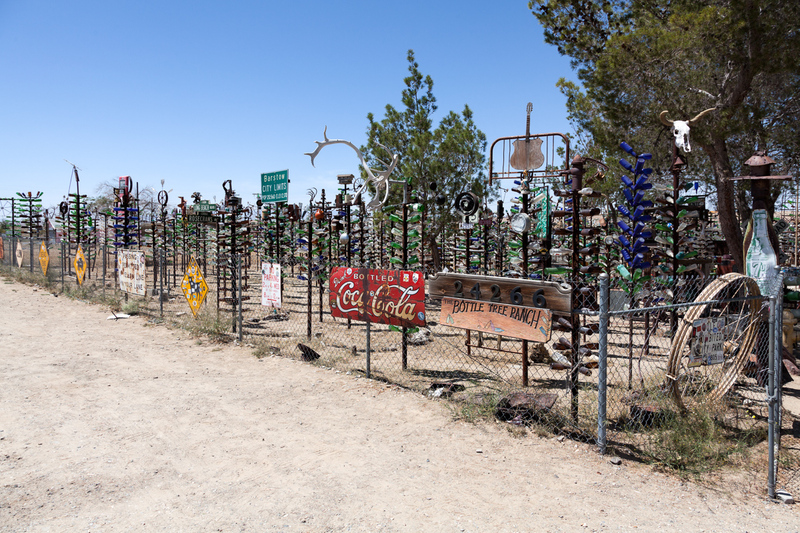 Metal posts with several small metal "branches" sticking out with bottles slid loosely onto them. When the wind blows, this place makes a lot of somehow appealing noise. Giant wind chimes times 200+. Items large and small are part of the collection, not just bottles. This old Willys jeep has a permanent home. 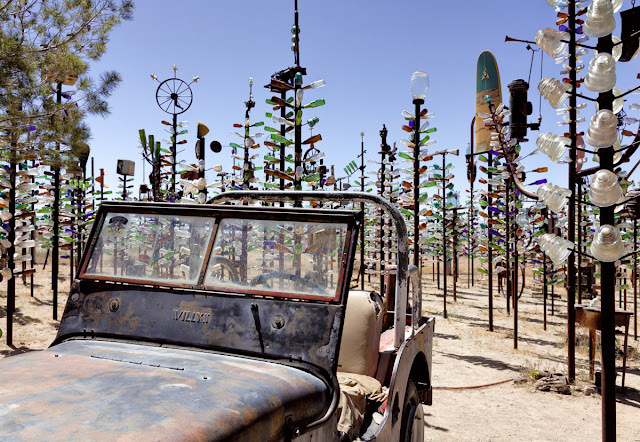 The trees and posts are topped with an eclectic variety of old wheels, guns, lanterns, wagons, toy cars, weather vanes, toys, signs, cash register and so much more. An old typewriter, horn, sink with doll. This gives you an idea of how full of stuff this place is and the variety you'll find here. 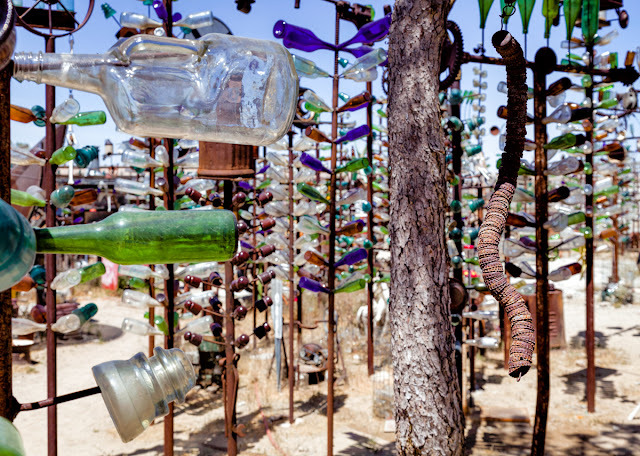 This is just one section of the Bottle Tree Ranch. Finally, you can't have this many bottles without a few bottle caps hanging around. I highly recommend a visit. 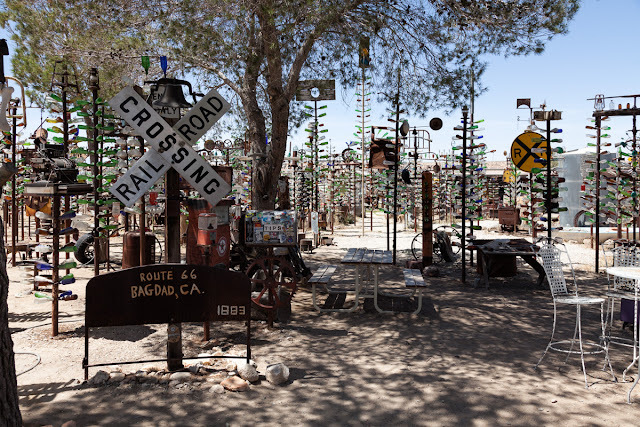 This is a classic Route 66 roadside attraction. Who knows, Elmer himself may be out to talk with his visitors. 2017 Monrovia Days - The Carnival Returns!